Last week while members of our Executive Team were in Orlando for the Gazelles Fortune Leadership Summit, we had two VoIP Innovations employees, Tim Linn and Joe Aponick, attend an invitation only training session with Sansay. They got to spend time with the Sansay Engineers and other engineers like themselves, from all over the country. We’re proud to say that both Tim and Joe are now Sansay Certified Technicians. As you know, we have recently launched a brand new ABG Capital website. That’s not the only website that has seen a facelift! Inspira has been growing very quickly over the past few months and it was time for their websites to reflect that growth. So far, we’ve updated Total IRA and Pinnacle IRA. We’re planning to release a new Payday IRA website in about two weeks and their Twitter account is already up and running! You might want to take a second to go and follow them. 🙂 The main Inspira site is the next one in line to be updated and we’ll be posting more details and a completion date soon. In the meantime, you can visit them on Facebook, Twitter, LinkedIn and now Google+. We’d like to mention a few more company announcements before we let you go for the weekend. We’re HIRING! ABG Capital, along with all of our portfolio companies are experiencing extremely rapid growth and we need more “A Players” to add to our team. Below is a list of the positions we are looking for. If you think you might be a fit, please email your resume to our HR Manager, Sharon Kolesar, at sharonk@abgcapital.com. She’ll be able to get you more information on these positions. Giving back to our community is something that we value very much here at ABG Capital. We’re always doing something that can benefit the organizations we support. The biggest giving back initiative that we focus on each is granting wishes for the Make-A-Wish Foundation. Last year we were able to grant two wishes and this year we’re shooting for three! The current fundraising effort we have going on is selling raffle tickets for a basket full of Martini related items. Unfortunately we can’t sell tickets for this basket to everyone in the world, but if you’re interested in supporting this fantastic organization on your own, visit the Make-A-Wish website and make a donation! Speaking of our giving back initiatives, today is the day that we’ll be heading to the National Cemetery of the Alleghenies to volunteer. We went last year and it was such a great experience. We’ll be cleaning headstones and helping to construct the Avenue of Flags in preparation for their Memorial Day services. Stay tuned for pictures of the day. We’ll be posting them on our Facebook page later today. Next week, you can expect to see some great blog posts showing up on the ABG Capital blog. The first will be on how Big Data can help to improve the customer experience and the second will be on choosing the best health plan for your employees. If you don’t want to miss these great posts, then simply enter your email in the subscribe box and you’ll get them delivered right to your inbox! That’s all we have for you this week, we hope everyone has a great Memorial Day weekend! As you know, we’ve been doing some massive art projects throughout the office. Well, this week we made another huge addition to the ABG Capital Office. That addition was a giant collage that includes everyone in the office. This was one project that we’ve been most excited about and we’re thrilled that it came out as perfect and we hoped. Check out the time-lapse video below to see it being installed. While we were celebrating the new collage, we had a visit from our property managers who haven’t seen the office since we started the build out a year ago. We have made some pretty drastic changes since then and they loved everything that we’ve done. They even brought a great bottle of Scotch as a gift (which we opened for an impromptu Scotch Friday). We’re very proud of the office we have now and we’re glad they love it as much as we do. Shannon Hogan, the newest addition to the Inspira Call Center, got to celebrate making it to her 30 day mark by going to the Rivers Club for lunch. Jeff and Jason Tapolci make it a point to take new employees out to lunch and get to know them. See how great they looked in the picture below! Happy Friday to everyone! 2014 is looking like it’s going to be a great year for ABG Capital and its portfolio companies. Business is going great and we’re planning some awesome things for our employees to take part in this year. As you read in our blog post last week, we were planning on volunteering at the Great Pittsburgh Community Food Bank. Unfortunately though, it looks like we maybe have to cancel that volunteering opportunities due to scheduling conflicts with the Food Bank. Our Giving Back Committee will be meeting soon to discuss the initiatives that ABG Capital can take part in in 2014. Some of the things that will definitely be on our list again are the employee payroll deductions that go towards our Make-A-Wish contributions, Headstone cleaning at the National Cemeteries of the Alleghenies and other raffles and fundraisers throughout the year. We’ll be keeping everyone informed of any new activities that we’ll be getting involved in this year! Stay tuned for more pictures as the art continues to fill our office! The last thing that I want to mention that you’re going to start seeing more great blog posts coming from us. The first one we have in store for next week talks about how to develop a positive corporate culture. This is something that we put a great deal of focus on and we want to make sure we have employee appreciation day 24/7, 365 days a year! 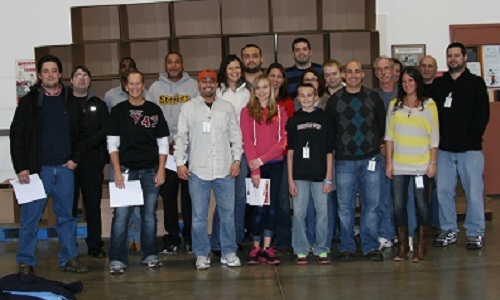 On Friday, November 2, 2012, nearly 20 employees from ABG Capital spent the afternoon at The Greater Pittsburgh Community Food Bank. This particular Food Bank distributes 2.2 million pounds of groceries a month, so they rely heavily on volunteers to help with packaging. The ABG Capital team worked in the Repack Center of the Food Bank and helped package up hundreds of pounds of frozen meat, poultry, and seafood items that were donated from local grocery stores. Located in Pittsburgh, PA, ABG Capital leverages its unique business management model to reduce costs through the consolidation of back office operations for its portfolio companies. By consolidating services like accounting, legal, IT, software development, Employees administration and HR, ABG Capital is able to eliminate redundancy among our portfolio companies and increase efficiency.